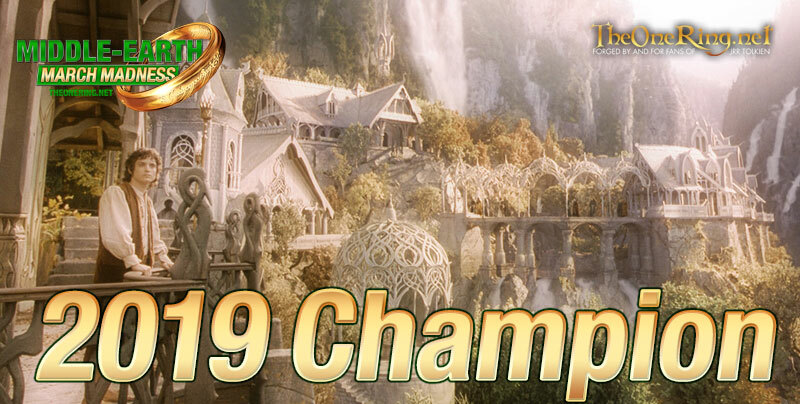 And then there were two… After two weeks of battles between some of the key locations of Middle-earth, we’re down to the two places which will fight it out to see who will be Grand Champion 2019. Two tough duels made up the semi-final. On one side, Bag End took on Rivendell; and as hard as that hole in the ground tried, it just could not overcome the power of Lord Elrond. 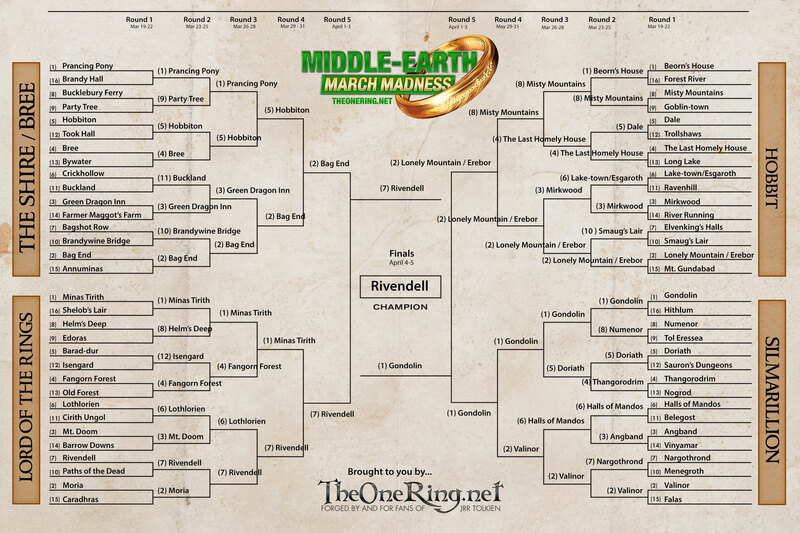 In the end, Rivendell took almost two thirds of the vote in this contest. On the other side, Gondolin faced off against the Lonely Mountain; and this was an epic fight indeed! The difference came down to less than 3%! But once again, the magic of the elves won through, and Gondolin just defeated Erebor. The dwarves will not be pleased! So now the hidden city takes on the hidden valley! Two elvish realms face off in the final: Rivendell vs Gondolin. Which location will be the ultimate victor? YOU DECIDE! Voting in the Final is open now, and only goes for TWO days, until 10pm EST on Friday 5 April. So don’t delay! Rally the troops and VOTE NOW on this post! The Grand Champion will be crowned on Saturday! The end is nigh; just two rounds of Middle-earth Map March Madness 2019 remain! We’re down to 4 locations; which are still in with a chance for the title of Grand Champion 2019? Three of our four categories in this round ended up with roughly two thirds to one third results. In The Shire this saw Bag End conquer its home, Hobbiton. In the Hobbit section, the one overcame the many, as The Lonely Mountain defeated the Misty Mountains. 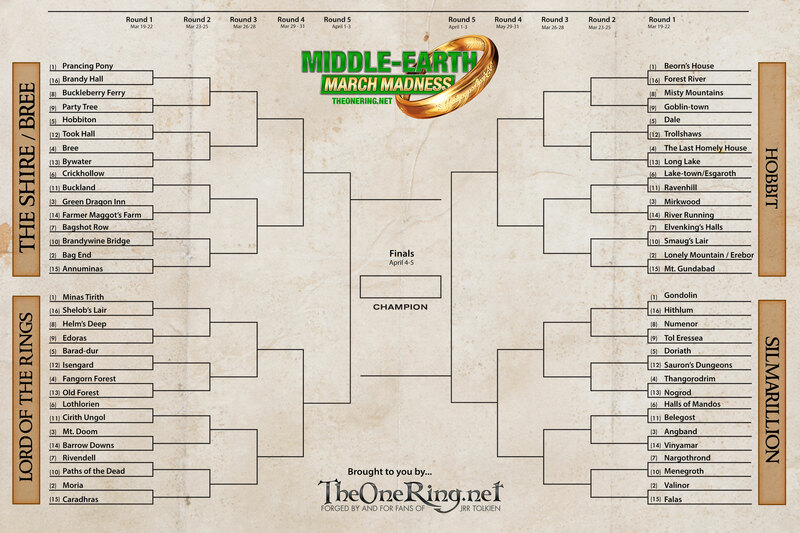 And in the Lord of the Rings bracket, the power of the elves remained strong: Minas Tirith could not overthrow Rivendell. In the Silmarillion group, however, the battle was much closer; and this time, elvish magic did not win the day. Valinor took an early lead, but in the end it was Gondolin which came out victorious, in a narrow victory with 52% of the vote. Now the brackets mix, for our final two rounds! Bilbo will have to choose between his own home in The Shire, and the home he loves to visit down in the valley, as Bag End takes on Rivendell. Gondolin marches for the Lonely Mountain; can men overthrow the dwarvish kingdom of Erebor? Will it be elvish stronghold vs dwarvish realm in the final, or will a simple hole in the ground (but not a nasty, dirty, wet hole, mind you) be facing off against a mountain? YOU DECIDE! Voting in the Semi Finals is open now, until 10pm EST on Wednesday 3 April. Tell your friends; get your supporters lined up; and VOTE NOW on this post! I recently visited “Tolkien – Maker of Middle-earth”, an exhibit at the Morgan Library and Museum in New York City, which runs through May 12. 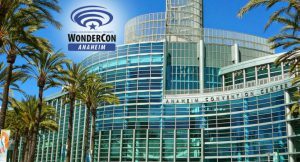 The exhibit is the most extensive display of original Tolkien material gathered in one place for several generations. It includes pieces from The Morgan, The Bodlein Library archive at Oxford University, the Marquette University Libraries in Milwaukee, and private lenders. 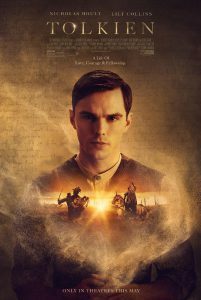 It takes you on a journey through the life of John Ronald Reuel Tolkien (or as we know him – J.R.R.) with photos, letters, text, and Tolkien’s own work. For me, it was a truly awe-filled and emotional experience. To enter the exhibit, you walk through the round green door of Bag End to behold a wall-sized mural of Tolkien’s painting of Hobbiton. There are other murals throughout the exhibit, and it is cool to see his work so large because things that are usually seen as tiny details are suddenly more apparent, and you are drawn in to the landscape. But the real attraction of the exhibit is Tolkien’s actual work. On display is an extensive selection of his original drawings, paintings and hand-written manuscripts. 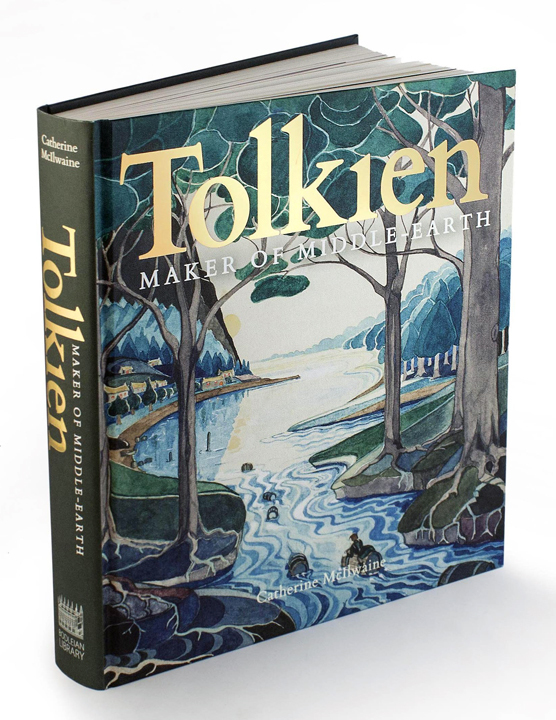 I can’t possibly describe in words what it is like to stand in front of the original hand-painted dust jacket for “The Hobbit”, replete with Tolkien’s handwritten comments in the margins; to view “Conversations with Smaug” so closely that you can see J.R.R’s brushstrokes; to revel in the light of “The Forest of Lothlorien in Spring.” One of my personal favorites is “Bilbo Comes to the Huts of the Raft Elves”, the image chosen for the exhibition’s catalog cover. If you can’t make it to the museum, I highly recommend this book with the same title as the exhibit. It is available online and includes full color images of every piece in the exhibit along with the accompanying text. There are early sketches for The Doors of Durin, which were a special treat for me because I recently painted a life-sized version of the West-Gate of Moria (Speak “Friend” and Enter) at Scum and Villainy Cantina in Hollywood, where Torn Tuesday is broadcast from. 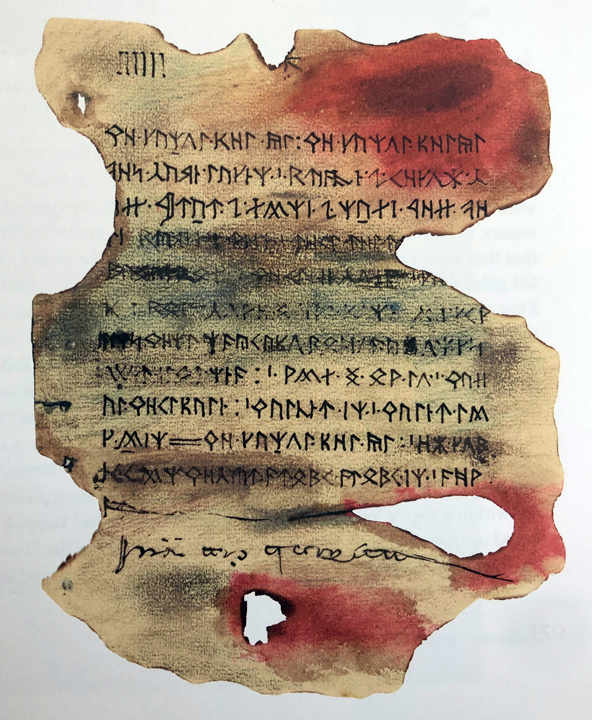 There are even pages Tolkien created to look like they were from The Book of Mazarbul – the book that the Fellowship finds besides Balin’s tomb – hand-calligraphed, painted, torn and burnt. Tolkien the artist could have found himself a place on the team at WETA. 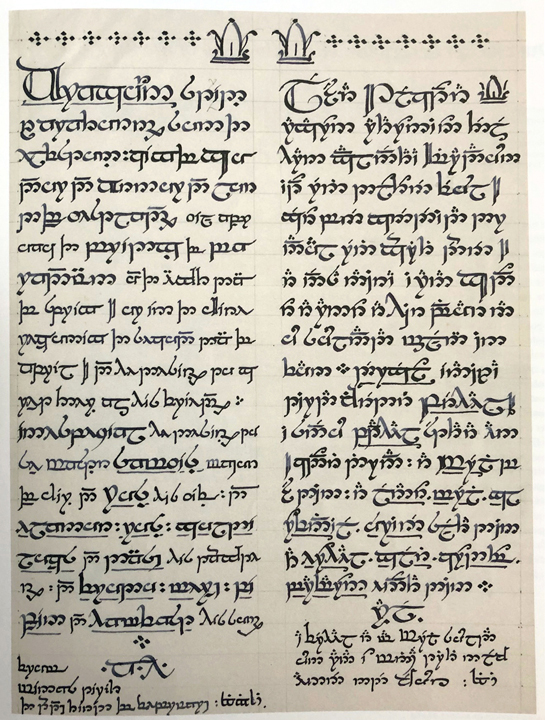 There were many manuscript pages filled with Tolkien’s tight, flourishy handwriting, written first in pencil, then erased and crossed-out, then written over in ink. It’s amazing to me that these were able to be deciphered and included in the books. 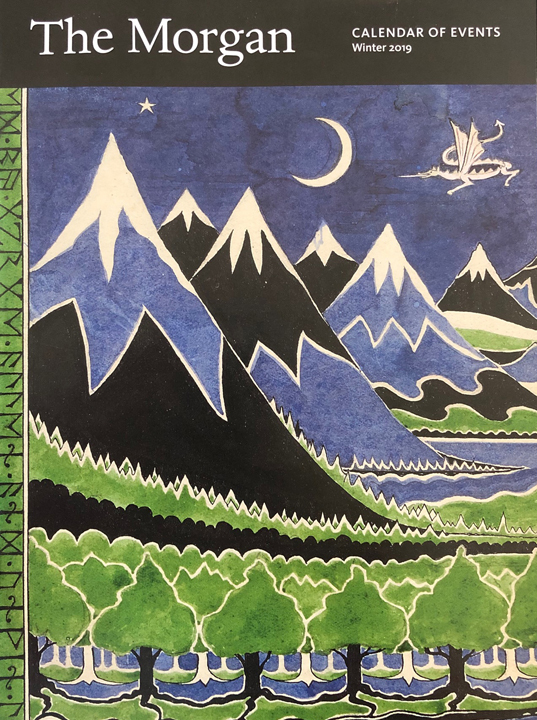 There were quite a few different, and often large, hand-drawn maps of Middle-earth; original book jackets for LotR; some of the charming drawings and letters from Father Christmas that Tolkien sent to his children. And there were illustrations I’d never seen before – beautiful pieces expressing Tolkien’s vision of Fairy and his ideas about how creativity flows. There were even full-sized newspaper pages crammed with his colorful doodles, some quite Elven in style. One thing that really struck me was a hand-calligraphed letter that was meant to be reproduced and included at the end of the Lord of the Rings, but unfortunately, the publishers nixed the idea. The letter was from Aragorn to Master Samwise, letting Sam know the King would be stopping for a visit outside the Shire. The letter has two versions side-by-side written in Tengwar – one in Sindarin, the common tongue, and one in the high-Elven speech, Quenya. It makes me think Tolkien knew that his epic story would go on and on, even if he could never have imagined the film-making technology that would become available to make it happen. I hope you have a chance to see the exhibit, for it is truly incredible and a joy to behold. It’s Quarter Final time in Middle-earth Map March Madness 2019! 64 locations began this epic battle; now only 8 remain. Which are still with us? News from The Shire which I personally find tragic: the Green Dragon Inn is out! Alas, the pub could only muster just over a quarter of the vote; Bag End looks like a hot favourite to go all the way in this contest. The Shire’s other pub, the Prancing Pony, is also out, beaten by Hobbiton. In the Lord of the Rings section Minas Tirith easily conquered Fangorn Forest, once again securing a victory with almost three quarters of the vote. The other duel in this bracket was a tough one: Lothlorien vs Rivendell! How did YOU choose between those two elvish strongholds? In the end, it was Elrond who conquered Galadriel, with two thirds of the poll. For the second round running, the closest face off in this round was to be found in the Hobbit bracket; this time Elrond was not victorious, as the Misty Mountains defeated the Last Homely House, but with only just over 1% in it! The Lonely Mountain had a more convincing win over Mirkwood, claiming almost 70% of the vote. Finally, in the Silmarillion group Gondolin and Valinor are still cruising through, taking 86% and 85% respectively. Could one of these locations go on to be the overall winner? Just one more round within brackets remains, and there are some tough choices to be made! Hobbiton takes on Bag End; Minas Tirith throws down with Rivendell; the mountains face off as Erebor challenges the Misty Mountains; and in perhaps the most epics of duels, Gondolin confront Valinor. Which locations will be triumphant, and move on to the semi finals? YOU DECIDE! Voting in Round 4 is open now, until 10pm EST on Sunday 31 March. Rally the troops for your favourites, and VOTE NOW on this post! Middle-earth Map March Madness: Round 1 update! The biggest leaders at the moment are Minas Tirith, beating Shelob’s Lair 92% to 8%; Valinor beating Falas by the same margin; and strongest of all, Gondolin is thrashing Hithlum, so far having 94% of the vote. Readers may be surprised to know that the Brandywine Bridge is currently beating Bagshot Row, though there’s only 14% in it. 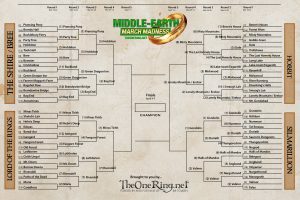 Helm’s Deep is 12% ahead of Edoras, so get over there and vote if you don’t want the Golden Hall to go out in Round 1! The closest fought battle right now is between Smaug’s Lair and the Elvenking’s Halls, with the fiery fellow currently beating Thranduil’s home by just 8%. Your vote could be the one which tips the balance! Voting in Round 1 will close later today, so don’t delay! VOTE NOW! [Click here] Round 2 launches tomorrow!